Fashion's Sense: What Are My Beauty Vices? What Are My Beauty Vices? Hey lovelies! I can't believe the Blogging from A to Z April Challenge will be over in a few days! For this Wednesday, I want to let you guys know what my beauty vices are. I have one for makeup, skincare, hair care, and body care. This one is easy. I am a body oil junkie. Of all body care items body or bath oil is the one thing I always find myself buying. My number one body oil vice is Avon's Skin-So-Soft oil. I buy the original most often because it comes in larger sizes. I also like the soft & sensual. I only buy them now when they go on sale because it used cost $16.99 but it is now $20 with no formula change just packaging. Yeah, still a bit mad about that one. Again, it boils down to oil. I will buy extra virgin coconut oil and olive oil for my hair. Not for cooking. Just for my hair. They are the two main oils I will keep on hand. I will buy other oils to mix with them like castor oil, jojoba, and argan oil. Clay masks used to be my skincare vice until I hit age 37. At age 37 I was introduced to face serums. I have not looked back since. Serums are my major skincare vice. They make my skin look refreshed and it feels like my other skincare perform better when used with serums. My favorite are vitamin C and retinol serums . Both types of serums usually contain hyaluronic acid which my skin loves. Urban Decay's slogan for their Vice lipsticks spoke to my life. Seriously lipstick and its versions (gloss, tints, stains, etc.) are my vice. I have a makeup bag and the top two draws in a train case fill with lip color. They still don't hold all my lip products. I don't feel any shame in telling you guys this because judging from the pics I see on Instagram, I know I am not the only one! They you have them lovelies. My beauty vices. They are nothing weird but they are products I always need on hand. I do have to admit that of all of these vices, lipstick is the biggest one. 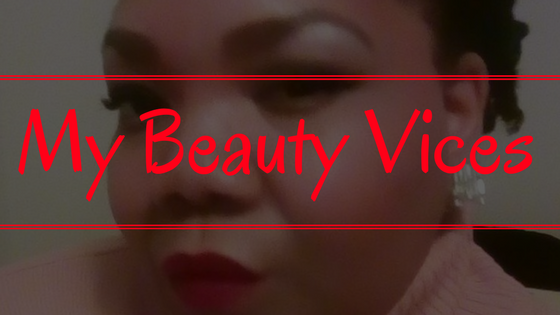 What are your beauty vices? Let me know in the comments below.